Got a note last night from reader KY saying that the old “Search All Mailboxes” bug has been fixed. I wonder if one of the non-security Office 2016 patches this month also provides the fix. (There were three patches specifically for Office 2016 this month.) Darned if I can find any documentation about it, though. KY confirms that his fix came through Click-to-Run. Non-security patches (fixes and enhancements) for Office are normally released on the first Tuesday of the month, which will be July 4. 2017. Security updates are issued on the second Tuesday. UPDATE: Microsoft has updated the above “Fixes and Workarounds for recent issues in Outlook for Windows” page as of July 5, 2017. 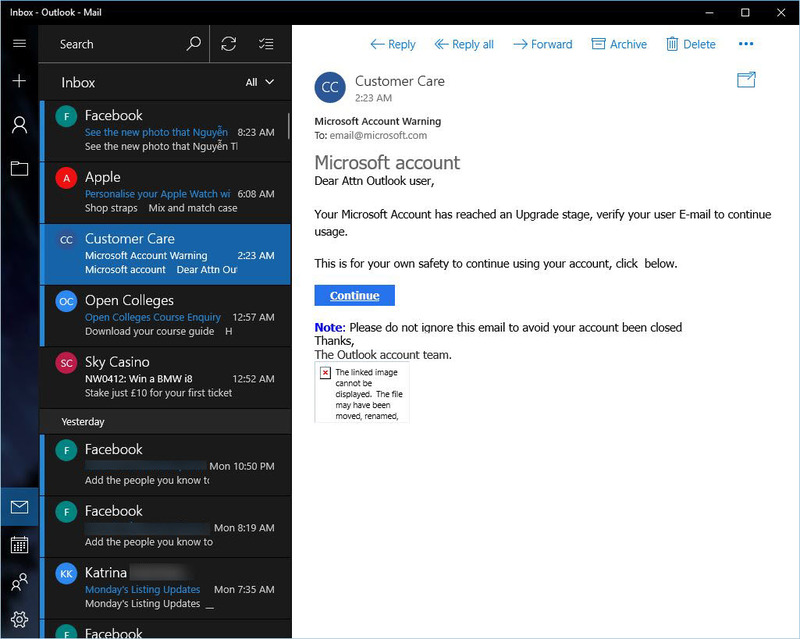 New Outlook updates are available. Does KB 3150513 trigger “Cannot start Microsoft Outlook”? You may recall KB 3150513, the “upgrade enabling” patch that nobody seems to want. It was last re-released on April 23. Thanks again for doing what you do and the information you share! Wonder why I don’t use Microsoft Mail and the Outlook email service? Could somebody tell me how, in this day and age, a spam message like that could make it all the way to an @outlook.com address, break through, and get displayed in Windows 10 Creators Update’s Mail application? Sorry, folks. I’ll take Gmail any day of the week. KB 3114389 may be causing Outlook to crash. We are pulling it now to check, it might be linked to software or an ATI graphics card. It’s Office 2016 (not 365).